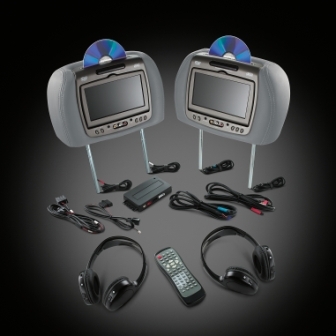 Make time fly for your rear-seat passengers with a Dual DVD Rear Seat Entertainment System. The dual LCD monitors and DVD players are mounted on the rear of the front seat head restraints. Wireless headphones and a single remote control allow rear passengers to enjoy the audio program without disturbing the driver or other passengers. This accessory system is not compatible with the factory rear seat entertainment option.